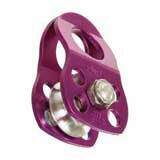 CMI Micro Pulley 1/2" Capacity & Moveable Cheek Plates Purple. This CMI micro pulley is one of our most popular climbing pulleys. Often used in knot tending applications and others. Features and specifications: Aluminum Cheek Plates and Sheave. Moveable cheek plates for easy insertion anywhere in a line.